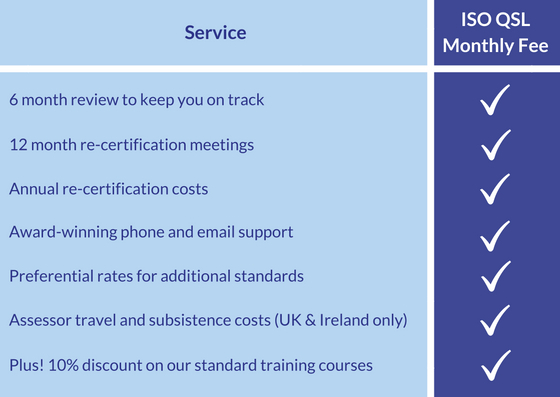 ISO Certification with no hidden extras! In addition, you will have access to our Client Area where you can access forms and templates relating to your ISO certification, find answers to frequently asked questions, watch tutorials and more. Our award-winning customer service is a key part of our ISO certification package. Our four key values are simplicity, transparency, fairness and integrity. Don’t just take our word for it, our clients have shared their views with you in our Customer Satisfaction Survey, Case Studies and our five star Google Reviews. Although we are open and honest about our fees, we will never send you a quotation without speaking to you first. This is to ensure that the services we propose meet your unique needs. You can request a quote here. Our contract period is only for three years as we believe this is the time it takes for a management system to fully mature and develop. We find that this is long enough for our clients to feel the benefits of their system and our 90%+ retention rate reflects this.